DUMBARTON played their first pre-season at home to premier division Dundee — and at times the new look side looked good. Some 400 fans who turned up at the Cheaper Insurance Direct Stadium saw the new home strip and an entertaining game, but had to endure midges on the rampage. Manager Stevie Aitken fielded several new signings and had five trialists on the bench who all appeared in the second half, and they never looked outclassed by their more illustrious opponents. 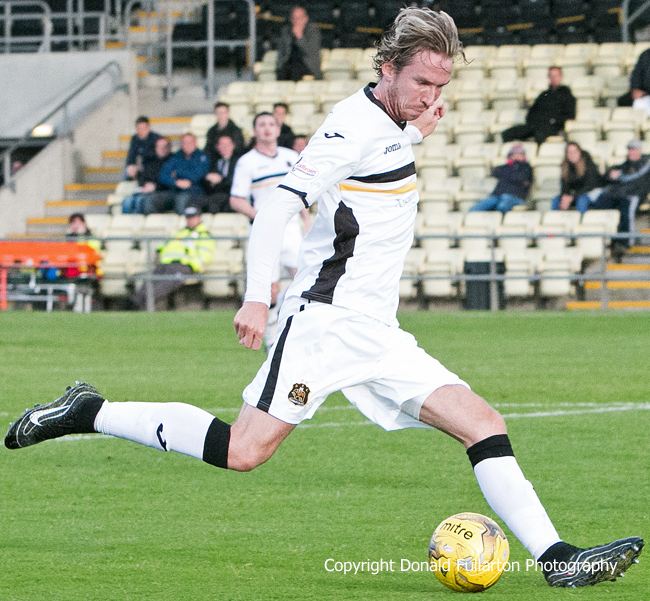 The scoreline ended 2-1 in favour of the Paul Hartley's men. The visitors took the goal initiative midway through the first half when Cameron Kerr took advantage of a defensive mix-up between Mark Docherty and keeper Jamie Ewings. Dundee held on to their one-goal lead until late in the second period before a Ryan Stevenson corner was headed home by Gregor Buchanan to bring Sons deservedly level. However Kerr grabbed his second goal of the night just before the final whistle to give the Dens Park team a narrow victory. New no.9 Robert Thomson (pictured), signed from Brechin City, posed a real goal threat but could not get on the scoresheet.